So here’s a little something I’ve been working on for quite a while. 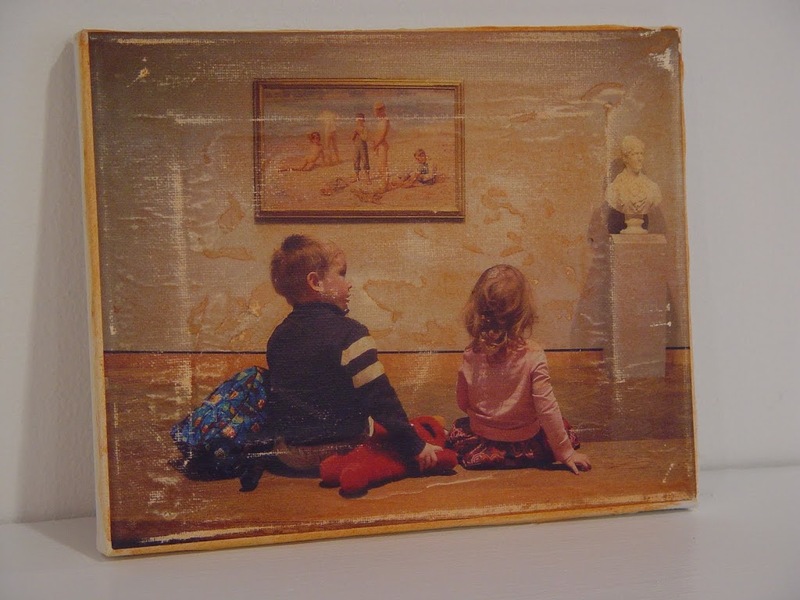 I had this beautiful photo of my kids at the Minneapolis Institute of Arts sitting on a bench admiring some paintings. I took the photo and transferred the image to a canvas using gel medium (see this great tutorial, for instructions on doing this step.) I had some trouble getting all of the paper off. I had to do it a few times. I ended up rubbing off some of the image, and then wasn’t pleased with the result so I started over again, and again, and again until I finally got something I liked. To age the image, I sanded it a bit (by hand) and stained it with a watered down rust color acrylic and then rubbed almost all of it off. (See here for some info how to do that step.) Lastly, I sprayed it with a clear, matte varnish to protect it.